For reasons scientists can't yet explain, the northern lights blazed up in a dazzling display this week, despite the apparent lack of a major solar flare typically associated with these celestial light shows. The weird northern lights display began on Valentine's Day (Feb. 14), when an uptick in activity in Earth's magnetic field sparked a geomagnetic storm, according to the skywatching website Spaceweather.com. 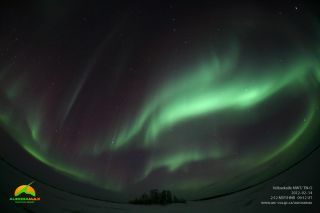 "Sometimes the sky surprises us," astronomer Tony Phillips wrote on Spaceweather.com. "On Feb. 14-15, with little warning, geomagnetic activity rippled around the Arctic Circle, producing an outbreak of auroras that veteran observers said was among the best in months." The Canadian Space Agency's AuroraMAX camera, which records the northern lights and posts them on the Web, snapped several stunning photos of the bright green auroras on Tuesday and Wednesday. Skywatchers also wrote in to Spaceweather.com with their impressions from the northern United States, Sweden, Norway and other northern locales. According to Phillips, there was some early speculation that a Feb. 10 sun storm, known as a coronal mass ejection (CME), may have triggered the northern lights show, but this solar outburst has not yet been confirmed. Auroras occur when charged particles from the sun interact with Earth's upper atmosphere, creating ripples of glowing light. The charged particles are funneled to Earth's poles by the planet's magnetic field, so the auroras are typically only visible to skywatchers in far northern or far southern latitudes. The northern lights are called the aurora borealis, while the southern lights are dubbed the aurora australis. "The reason for the outburst is still not completely clear," Phillips wrote in a post today (Feb. 16). "No CME was obvious in local solar wind data at the time; the disturbance just … happened." The sun is currently in an active phase of its 11-year solar weather cycle. The current sun cycle is known as Solar Cycle 24.